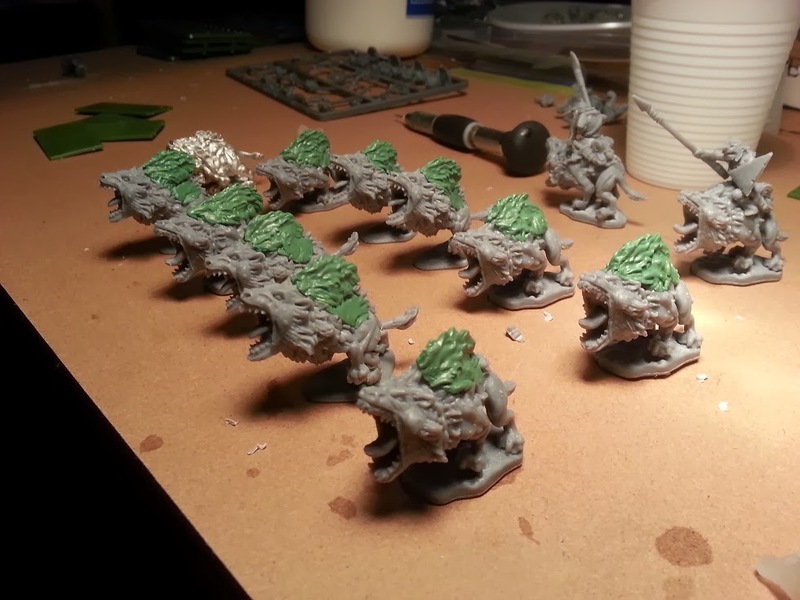 If you are planning to put together a goblin army for Kings of War you probably have a huge budget problem when it comes to Mawbeasts. They are a great unit but the metal models are really expensive, for this reason I started to think a way of converting the restic Fleabag riders into Mawbeasts. Use the back of the metal mawbeast and make a mold out of it (you need just a mold of the furry back not the whole model). In order to do this you have to warm up the Instantmold into how water (be careful!) press it on the mawbeast's back and wait for it to cool down. Before assembling the fleabag riders you have to cut the legs from the ride, you can use a plastic cutter and then take out the small pieces with something sharp. This will leave a huge flat gap on the fleabag's backs that will be filled in next step. Now it's time to make the furry back's, make sure that the mold is wet (it will be easier to take out the green stuff) then press some green stuff in the mold. Turn the mold over and press it on the fleabag back assembled in previous step. Make sure that the green stuff stuck onto the model and carefully take away the mold. The picture below shows the final result.